EU Law Analysis: The European Commission’s Activation of Article 7: Better Late than Never? The media have so far only almost exclusively focused on the first ever invocation of what is often described as the EU’s ‘nuclear option’, which, however, as correctly pointed out by Frans Timmermans in his press conference announcing the Commission’s actions, is a misnomer (as we previously argued here). To put it briefly, Article 7 TEU provides for two main mechanisms: a preventive one in case of a ‘clear risk of a serious breach’ of the values common to the EU and its Member States and a sanctioning one where ‘a serious and persistent breach’ of the same values has materialised (for more detailed commentaries on the mechanics of Article 7 see here and here). On 9 May 1950, the venerable Schuman Declaration invited all the free European states to join the unification project, implying respect for the rule of law, a democratic system of government, and a market economy. The initial versions of the Treaties presumed compliance of the Member States with these principles, now reflected in Article 2 TEU. The enforcement of compliance was nevertheless strictly confined to the scope of the law of the EU via what are now Articles 258 and 259 TFEU, later reinforced by Article 260 TFEU, thus leaving compliance with the EU’s foundational values almost exclusively to the care of the constitutional systems of the Member States. The first shift towards a more active role to be played by the EU in this respect happened in 1978 when the Commission contemplated a proposal for a possible sanctions mechanism against the backdrop of the then upcoming Greek accession. A few years later, the European Parliament draft EU Treaty from 1984 contained such a mechanism for the first time. Later on, the EU began systematically including ‘human rights clauses’ in all association and cooperation (‘Europe-’) agreements with the Central and Eastern European states and incorporated these into the fabric of the pre-accession political conditionality in the areas of democracy, the rule of law and human rights. In anticipation of the forthcoming accession of numerous countries to the EU, the Treaty of Amsterdam included the first version of Article 7 which only provided then for possible sanctions in a situation of ‘serious and persistent breach’. With the Nice Treaty, Article 7 TEU was revised to further enable the EU to adopt preventive sanctions in the situation where there is ‘a clear risk of a serious breach’ of the EU values by a Member State. This change was made to enable the EU to step in in a situation similar to the one in Austria following the formation of a governmental coalition involving Jorg Haider's far-right Freedom Party. Before the Nice amendment, EU’s involvement with Austria took the form of a series of illegal ad hoc ‘bilateral sanctions’ imposed on Austria by 14 other Member States acting, strictly speaking, outside of the framework of EU law. These diplomatic sanctions were ended when the report issued by a “wise men” committee, which was set up to investigate the political and human rights situation in Austria, concluded that Austria’s record and commitment to common European values, including the rights of minorities, refugees and immigrants, was at the time of the report satisfactory: the illegal sanctions triggered by the election result would thus clearly not be justified under the amended Article 7 either. One might note in this respect how times have changed when the Freedom Party's inclusion in a coalition government in Austria last week passed almost totally unremarked this time. It is wise however for the EU not to overreact to election results, but to instead react to actual breaches of the values common the EU and its Member States. In the light of this episode and other factors explored in this blog post published in January 2015, the European Commission thought it useful to adopt a pre-Article 7 procedure in 2014 to address systemic threats to the rule of law in any of the EU’s 28 Member States in response to the EU-28 governments’ express request in 2013 that the Commission should ‘take forward the debate in line with the Treaties on the possible need for and shape of a collaborative and systematic method to tackle’ rule of law backsliding (this is why it beggars belief that some EU national governments are now complaining that the Commission is finally taking this existential issue seriously). The new pre-Article 7 procedure was activated for the very first time in January 2016 following the non-respect by Polish authorities of crucially important rulings of the Polish Constitutional Court and the adoption of new rules with respect to Public Service Broadcasters. As we predicted in this January 2015 post, any soft dialogue with authorities bent on undermining if not completely dismantling all checks and balances was bound to fail and this is indeed what has happened with respect to Poland. It was also bound to create more space within which the determined autocrats in the Polish governing party would have more time to consolidate their unchecked power in relative peace. Be that as it may, having at last accepted the totally fruitless nature of the so-called constructive dialogue with Polish authorities, the European Commission finally decided, ‘with a heavy heart’, to activate Article 7(1). 3. Is the Commission’s decision to initiate Article 7 justified? First, we agree fully with Frans Timmermans when he said earlier this week that the ‘common pattern’ of all the legislative changes targeting the judiciary in Poland ‘is that the executive or legislative powers are now set up in such a way that the ruling majority can systematically, politically interfere with the composition, the powers, the administration and the functioning of these authorities, thereby rendering the independence of the judiciary completely moot.’ We also share the view recently expressed by Vera Jourova and according to which 'if one national system of judiciary is broken, the EU system is broken’. A full account of the measures taken to remove checks and balances would take more space than we have here, so we can only but give a flavour of the so-called ‘reforms’ devised by Poland’s ruling party and which have been repetitively and publicly criticised (a point which the Polish government tends to conveniently forget). It is not just the European Commission that has repeatedly criticised the Polish reforms, but also the European Parliament, key bodies of the Council of Europe such as the Venice Commission, the United Nations Human RightsCommittee, the OSCE Office for Democratic Institutions and Human Rights as well as representatives of the judiciary across Europe, including the Network of Presidents of the Supreme Judicial Courts of the European Union and the European Network of Councils for the Judiciary. 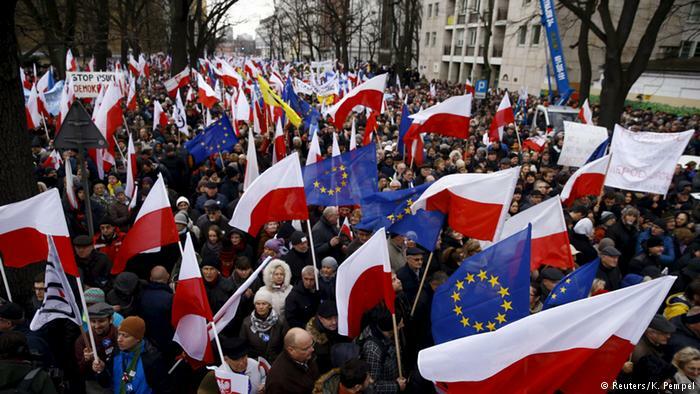 Numerous civil society organisations such as AmnestyInternational and Human Rights Watch have also expressed concerns and tens of thousands of Poles have taken to the street to protest the attacks on their own judiciary. In light of yesterday’s visit to Poland by the British Prime Minister and her failure to publicly and unambiguously criticise the country’s ongoing descent into authoritarianism (when asked about the Commission’s activation of Article 7(1) Theresa May said: ‘These constitutional issues are normally, and should be primarily a matter for the individual country concerned’), it is may also be worth recalling that a number of UK bodies have also expressed their strong concerns regarding the situation in Poland. For instance, last July, the Bar Human Rights Committee of England and Wales called on ‘the Polish President, government and parliament to reject these draft laws and to withdraw and repeal all the measures which pose such a grave threat to judicial independence and the rule of law in Poland’. Previously, the body which represents independent judges in England and Wales issued a press release to make clear its concerns 'about the proposed situation in Poland and any impact on judicial independence'. Last but not least, let us not forget the recent and significant intervention of the Court of Justice in the Białowieża Forest infringement case in the context of which the Court decided that Poland should be subject to a penalty payment of at least €100,000 per day should it be found to have violated the Court’s order. They did so because Polish authorities’ declared that they would ignore a previous order adopted by the Vice-President of the Court to that effect. This was another factor which led the European Parliament to adopt a resolution on 15 November 2017 in which the Parliament describes the current rule of law situation in Poland as representing ‘a clear risk of a serious breach of the values referred to in Article 2 of the TEU’ and in which the Parliament also rightly deplored ‘the Polish Government’s refusal to implement the order of the Court of Justice of the EU on logging in the Białowieża forest’. The European Commission therefore is hardly alone in its criticism of the Polish ruling party’s repeated attacks on the rule of law notwithstanding the Polish government’s ridiculous claim repeated ad nauseam that these attacks are politically motivated. Three examples may also suffice to demonstrate that what the Polish ruling party calls ‘reforms’ are nothing but a set of unconstitutional and autocratic changes which aim to completely subjugate the judiciary to the will of the ruling party under the guise of the ‘will of the people’, no matter how plainly incompatible these changes are with both the Polish Constitution and Poland’s international obligations. Frans Timmermans was entirely correct to point out that the constitutionality of legislation in Poland is longer guaranteed following the successful but unconstitutional capture of the Polish Constitutional Tribunal via the unlawful appointment of ideologically compatible ‘judges’ and the rushed installation, specifically in violation of a request from the Commission, of a new president of the Polish Constitutional Court in December 2016 (for further analysis see the 2017 posts by Pech and Scheppele: Part I; Part II; Part III). The situation is now so out of control that crucial rulings of the Constitutional Court that were made before it was captured ‘have been removed from the register of the Tribunal which is accessible from its website’ while ‘other judgements which were not yet published at the time of the adoption of the Recommendation of 21 December 2016 have by contrast been published on 29 December 2016 in the Journal of Laws’ (see para 5 of Commission Recommendation 2017/1520 of 26 July 2017). We are here in Orwellian and unprecedented territory for a country belonging to the EU and space precludes any analysis of the also unprecedented use (again to the best of our knowledge) of criminal law provisions designed to protect State institutions by the unlawfully appointed President of the Polish Constitutional Tribunal to silence her critics (see analysis here). Secondly, Polish authorities never shy away from describing their ongoing destruction of the Polish judiciary as being in line with European standards or, failing that, as a pure matter of national sovereignty: two ludicrous points as explained here in a study co-authored by Professors Pech and Platon. Let’s take for instance the forthcoming ‘reform’ of the Supreme Court. It is nothing less than a total purge of its current membership which should take two to three years to be completed. As noted by the Commission, by lowering the retirement age and applying it to current Supreme Court judges, the Polish ruling aims to compulsory retire right away ‘almost 40% of the current Supreme Court judges’ with the additional discretionary power given to the President of the Republic ‘to prolong the mandate of Supreme Court judges’ with all new Supreme Court judges to be appointed ‘by the President on the recommendation of the newly composed National Council for the Judiciary, which will be largely dominated by political appointees’. One should note in passing that the Minister of Justice, on the basis of another set of provisions, has already gained the power ‘to appoint and dismiss all presidents of courts without concrete criteria, no obligation to state reasons and no judicial review’… This will prove no doubt useful at the time of the next parliamentary elections as the Supreme Court has jurisdiction over the validation of election results (the Polish ruling party has already begun the process of amending electoral rules with no doubt the aim to make sure it will not be in a position to lose them ever again, and a process which no doubt they will try to defend as another necessary ‘reform’…). To make matters even worse, the new process of ‘extraordinary review’ of final judgments laid down in the Act on the Supreme Court, which the Venice Commission described as having a lot of similarities with the ‘old Soviet system’ and as jeopardising the ‘stability of the Polish legal order’ in its most recent Opinion on Poland. Indeed, again as noted by the Venice Commission, under this new process, ‘it it will be possible to reopen any case decided in the country in the past 20 years, on virtually any ground. Moreover, in the proposed system the new judgements, adopted after the re-opening, will also be susceptible to the extraordinary review. It means that no judgment in the Polish system will ever be “final” anymore’ (para 58). This is as breath-taking as it is unprecedented for a country belonging to the EU and in this respect we also share the Venice Commission’s finding that some aspects of the Polish judicial ‘reform’ targeting its Supreme Court ‘have a striking resemblance with the institutions which existed in the Soviet Union and its satellites’ (para 89). Viewed in this light one may be forgiven for thinking that the European Commission should have moved right away to the sanctioning branch of Article 7 TEU by initiating Article 7(2) rather than Article 7(1). With its neo-Soviet approach to the division of powers, Poland is already closer to Belarus in the structure of its institutions than it is to any other European state. But, as the best is sometimes the enemy of the good, we can understand why the European Commission would prefer to proceed with the preventive arm of Article 7 first. Indeed, going straight to the European Council would mean having to secure a unanimous determination regarding ‘the existence of a serious and persistent breach’ in Poland before the eventual suspension of ‘certain of the rights deriving from the application’ of the EU Treaties to be agreed under a lighter procedure laid down in Article 7(3) TEU (qualified majority in the Council is then required). Importantly, the Commission faced no legal obligation to start with 7(1) TEU first, as Article 7(2) TEU – unanimous finding by the European Council of the existence o the breach of values can unquestionably serve as the entry point into the palette of what Article 7 TEU has to offer. 4. Will the triggering of Article 7(1) make a difference? While we welcome the Commission’s decision to submit a reasoned proposal to the Council having rightly concluded that there is a ‘clear risk of a serious breach by the Republic of Poland of the rule of law referred to in Article 2 TEU’ (para 127 of the reasoned proposal), the triggering of this provision is overdue and, as one of us previously argued in October 2016, the right time to have done so was November 2016 before the all too predictable unconstitutional capture of the Polish Constitutional Tribunal which happened at the end of December 2016. The continuing and misplaced faith in ‘dialogue’ with a government so clearly following Orban's autocratic blueprint has meant that the Polish ruling party was able to undermine if not annihilate virtually all checks and balances one year before the Commission moved to act, fulfilling its duty as the guardian of the Treaties. The Commission may also be criticised for not triggering much earlier on Article 7(1) against ‘both Poland and Hungary even apart from the instrumental reason that Article 7 TEU is foiled by two rogue states acting in concert if sanctions are attempted against them one at a time’. In this respect, sceptics may argue that the triggering of Article 7 is bound to fail as ultimately, ‘rogue countries’ may just protect one another should the Commission (or one third of the Member States) decide to activate the sanctioning mechanism laid down in this provision. While this is a minority view we share the argument first defended by one of the present authors that in a situation where ‘Article 7(1) is invoked against both Hungary and Poland at the same time, neither should be able to vote if Article 7(2) … is invoked against either one’. We believe this interpretation can be justified on the basis of the effet utile doctrine – a corollary to the teleological method of interpretation and which may be described as a ‘form of interpretation of treaties and other instruments derived from French administrative law which looks to the object and purpose of a treaty, as well as the context, to make the treaty more effective' (Encyclopaedic Dictionary of International Law). The purpose of seeking to ensure that a Member State complies with interim measures adopted by the Court hearing an application for such measures by providing for the imposition of a periodic penalty payment in the event of non-compliance with those measures is to guarantee the effective application of EU law, such application being an essential component of the rule of law, a value enshrined in Article 2 TEU and on which the European Union is founded. Be that as it may, we also agree with Frans Timmermans when he said that ‘the facts leave [the Commission] no choice’ but to initiate Article 7. As two of the present authors previously wrote, it was more than time ‘to oblige national governments to face up to their own responsibilities to keep European values at the centre of the Treaties’. The remaining question, of course, is why this argument has been used in the context of 7(1) as opposed to 7(2) given that the situation on the ground in Poland is clearly – in the view of the Commission, the Venice Commission and countless other actors – one of clear and persistent breach of values, as opposed to a threat thereof. The explanation might lie beyond the simple difficulty of the procedural requirements related to the sanctioning stage. Even though Article 7(1) is merely a warning without any direct sanctions, the indirect effects of triggering Article 7(1) should not be underestimated. To name but a few possible knock-on effects (further analysis and references here), the activation of Article 7(1) coupled with the forthcoming total subjugation of the Polish courts to the whims and interests of the Polish ruling party may lead the Court of Justice to set aside the principle of mutual trust and/or stop recognising Polish courts as courts within the meaning of EU Law (the ongoing and arguably insufficiently noticed infringement procedure concerning the Polish Law on the Ordinary Courts will require the Court of Justice to address, for the first time as far as we know, the independence of the whole judiciary of a Member State). This could then leave the European Commission no choice but to suspend EU funding to Poland, an option which according to Israel Butler is in any event already available to the Commission (on this issue see also a recent report ‘Can EU funds promote the rule of law in Europe?’). A functioning judicial system is not only necessary to maintain a constitutional government; it is also necessary to maintain a market economy. The impact on commercial arbitration involving Polish companies if not the financial markets may also in time be too significant to be comfortably ignored by Polish authorities. And while it was recently noted by Capital Economics that the experience of Hungary suggests that ‘recurrent run-ins’ with the EU ‘do not tend to have much impact on growth in the short-run’, ‘the potential impact on Poland’s growth prospects over the medium-term’ might eventually become significant for an economy which is not only highly dependent on EU funding but also FDI. Looking beyond the law and economics of Article 7, it is difficult to predict how the politics of Article 7 may play out. We do not believe the Austrian precedent means that a nationalistic backlash is necessarily bound to materialise and undermine the Commission’s attempts to stop Poland’s descent into authoritarianism. In the case of Austria in 2000, a number of EU countries overreacted as diplomatic sanctions were adopted before any evidence of any systemic attempts to undermine principles such as the rule of law or respect for human rights. And while the freezing of bilateral relations may have led to a rise in nationalist sentiments in Austria, which was unsurprising considering that diplomatic sanctions were adopted before a breach of Article 2 values in the country could be documented, using the ‘Austrian precedent’ to justify inaction against both Poland and Hungary makes no (legal) sense. In these two countries, we have a sustained track record and ample evidence of actual, repeated and systemic rule of law violations in these two countries starting in 2011 in the case of Hungary and starting in 2015 in the case of Poland. The Commission, as Guardian of the Treaties, should not, in any event, only seek to uphold the rule of law when facing an easy political constellation. All EU institutions but also national governments should carefully assess the long term cost of appeasement or inaction and stop prioritising how autocratic or nativist forces may reach to prioritise instead the broader interests of EU citizens, whose rights and obligations can now unfortunately ‘be defined, in part, by ‘illiberalregimes’ via their participation to the EU’s decision making processes’. The European Parliament did point out in December 2015 that Hungary was ‘a test for the EU to prove its capacity and political willingness to react to threats and breaches of its own founding values by a Member State’ and that ‘the inaction of the EU may have contributed to … the rule of law being undermined’ elsewhere in the EU. The Union’s passivity regarding Orban's ‘mafia state’ (in large part due to the leadership of the European People’s Party putting time and time again short term political considerations over the principles this party supposedly stands for) has no doubt emboldened Poland’s ruling party to not even bother playing to the gallery while they relentlessly destroy all rule of law institutions in plain sight and prepare the grounds for the de facto establishment of a one-party state. To end however on an optimistic note, one may refer to the seemingly beneficial political knock-on effects of the Commission's decision to initiate Article 7(1) in Romania, a country where the rule of law situation has been seriously deteriorating these past few months despite the country having been subject to a special rule of law mechanism since 2007. With reference to the Commission's decision, the Romanian President has warned the country's ruling coalition that the country could be next if the ruling coalition pushes ahead with its controversial changes to Romania's legal system. (v) Should Poland fail to comply with the Council’s recommendations within the foreseen three-month deadline post the adoption of the Council’s Article 7(1) decision, one would then expect this problem to be escalated to the European Council by the end of December 2018, but this would not be an automatic consequence of Poland’s failure to comply with any eventual Article 7(1) decision by the Council. Interestingly, it is also expected that the European Parliament will organise a plenary vote on whether to initiate Article 7(1) proceedings against Hungary in September 2018, in which case by the time the European Council might have to unanimously determine the existence of a serious breach, we could have both Kaczynski's Poland and Orban's Hungary subject to Article 7 proceedings, in which case, if one agrees with our effet utile reading of Article 7, both should lose their right to vote to protect one another in this context. It would indeed be quite an absurd construction of Article 7 if its deterrent effect simply disappeared when one rogue member state was joined by a second. Looking beyond Article 7 and as previously noted, we can only but deplore the EU’s failure to prevent and sanction rule of law backsliding from emerging first in Hungary before spreading to Poland. Faced with two member states that are violating European values, the most effective way to deal with the issue may be to cut off EU funding. We worry that this, too, is unlikely to happen in the absence of a ‘nuclear’ ruling by the Court of Justice, meaning a ruling leading to the suspension of the principle of mutual trust where Poland is concerned (further analysis here). The impact of bilateral diplomatic pressure if not the freezing of diplomatic relations would also most likely be effective but the need for the EU27 to remain united in the context of the Brexit negotiations means that this option is off the table. Thinking longer-term, multi-speed Europe may well solve not only the uneven willingness of states to move toward closer cooperation, but may also provide the perfect opportunity to leave behind states that are unwilling to fully adhere to basic principles. If the EU proves unable to rein in autocrats any other way, the incorporation of conditionality techniques into policing each of the integration’s concentric circles likely to become a necessary element of the edifice. As the speed and vectors of integration evolve, Poland and the likes of Poland could find themselves outside the scope of meaningful activity – behind the door of the integration’s kitchen. With the growing pressure on the Union’s values from a number of countries, this may be the most realistic way forward to preserve the EU as a union of value in the long run, while also being sufficiently open towards the states hijacked by autocratic and plutocratic forces.